Digital technology creates opportunities to accelerate growth as firms across the world become more connected. But the 2016 World Bank World Development Report, titled Digital Dividends, showed that the benefits are neither automatic nor assured. Firms’ use of digital technologies differs substantially across countries, and while the internet has reached almost all countries, the use of digital technologies is still basic in most developing countries (Comin and Mestieri 2013). In Mexico, 84% of firms with at least ten employees used the internet in 2012, but only 26% of employees had internet access, only 13% of firms used e-commerce for purchases, and 9% for sales. What is preventing developing countries from realising the benefits of digital technology? To answer this question, it is important to understand the channels through which IT affects productivity at the firm level. The relation between IT and productivity has been widely studied, but there is still relatively little evidence about these channels. Also, most results have focused on developed countries. Research suggests that firms must pursue complementary investments such as changes in business organisation and training, which imply additional costs, to successfully leverage IT investments (Jorgenson et al. 2008). Recent evidence shows that the lack of these complementary investments explains differences in the impact of IT on productivity between the US and advanced European countries (Bloom et al. 2012). But training and business reorganisations are costly, so does increased competition create the incentives to invest in them? In recent work, we constructed a two-period panel of firm-level information using Mexico’s National Survey on Information Technologies from 2009 and 2013 (Iacovone et al. 2016a). This provides detailed information on IT use and firm performance that, to the best of our knowledge, has not been used for research before. We analysed three physical measures of IT use: computers-per-worker, the share of labour with internet, and the share of labour with a computer. The surge of Chinese import competition in the Mexican market was used to measure differences in the degree of competition, using the change in the share of China in total Mexican imports for each sector between 2000 and 2008. We also checked whether more intense Chinese competition for Mexican exporters to the US market led to changes in Mexican firms' use of IT. 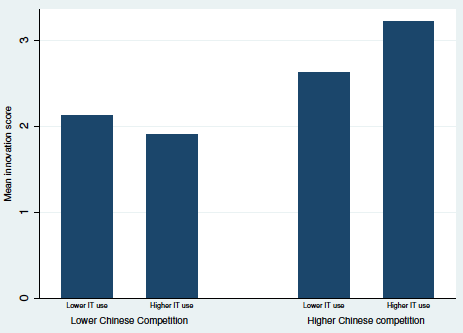 We found that firms that faced more intense import competition from China used IT more intensively (Figure 1) and more efficiently (Figure 2). Firms that faced this external shock of higher foreign competition between 2000 and 2008, either in the domestic or the US (export) market, increased the number of computers per employee, the share of labour using the internet, and their share of online purchases in total purchases in the subsequent four years 2008–12. 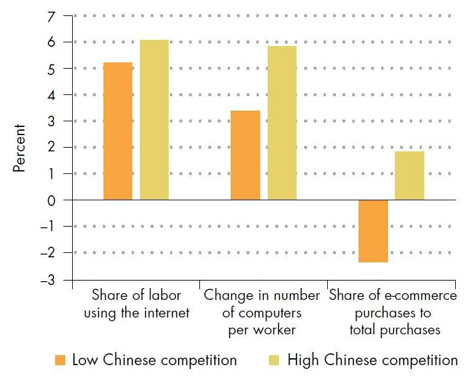 As a result, the number of computers per employee in 2012 was 11% higher for firms that faced more Chinese competition, and the share of online purchases was 114% higher. More intensive use of digital technologies for firms selling products that directly compete with imports from China also translated into higher manufacturing productivity growth. For example, firms that increased their share of workers using the internet from zero to one due to high import competition from China had 1.2% higher productivity growth between 2008 and 2012. By contrast, ICT use had no impact on labour productivity growth among Mexican firms that did not face import competition from China. The results are robust when using an instrumental variables approach, relying on subnational and sector-specific information on IT intensity, to account for the endogeneity between firms’ IT use and productivity. Source: Iacovone et al. (2016b). In contrast, we did not find any effects of IT on firm productivity among Mexican firms that did not face more external competition. Our findings are consistent with the hypothesis that competition provides incentives to pursue organisational changes and investment in training associated to IT. 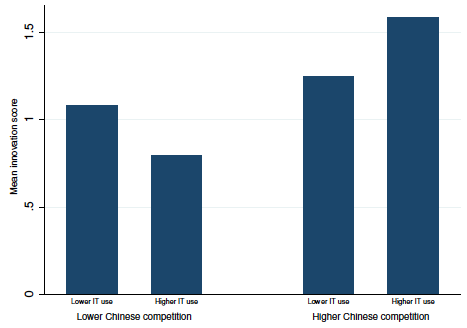 We found similar results when we analysed Chinese competition for these firms in the US market. The finding that firms in more contested industries use digital technologies more effectively would be consistent with a Schumpeterian mechanism. The allocation and selection mechanism in Mexican or US markets that are more intensively contested by competition from China drives Mexican firms (exporting to the US) to use digital technologies more intensively and productively. How does competition leverage IT effects on productivity? We also investigated the connection between competition, firm efficiency in using IT, and complementary investments by using a new set of questions that was included in the last wave of the survey. We used two scores on innovation that indicated the extent of complementary innovative investments that firms have implemented. The first one recorded innovation activities related to products and processes, such as reductions of training costs, improvements in the design of products, and plant scaling. The second measured organisation and marketing innovations, such as access to new markets, better communication within the firm, and implementation of automated systems. As Figure 3 shows, firms that faced more external competition had better scores in both product and processes innovation, as well as in marketing and organisation. In contrast, firms that invested in IT but did not face more external competition pressures did worse in terms of innovation. We also found that IT use only affected the probability of innovation for firms that competed with Chinese imports. Similarly, the probability of using software for logistics and distribution and control of processes increased with firms’ IT use when only among firms that faced more competition from China. Therefore, our results suggest that competition generated the incentives to use IT more efficiently by promoting not only a more intensive use of IT, but also encouraging the complementary investments in innovation and improvements in an organisation. When does IT boost firm productivity? We can conclude that the impact of IT use on productivity would be contingent on reforming regulatory barriers. This encourages firms to compete by investing in the efficient use of technology. For instance, subsidising IT is not enough if barriers to private sector competition through regulation, or insufficient antitrust laws, prevent a level playing field among all firms. Bloom, N, R Sadun, and J Van Reenen (2012), "Americans do IT better: US multinationals and the productivity miracle". The American Economic Review 102(1): 167-201. Comin, D, and M Mestieri (2013), "If Technology Has Arrived Everywhere, Why Has Income Diverged?" INET Research Note 26, Institute for New Economic Thinking, New York. Jorgenson, D W, M S Ho, and K J Stiroh (2008), "A retrospective look at the US productivity growth resurgence", The Journal of Economic Perspectives 22(1): 3. Iacovone, L, M Pereira-López, and M Schiffbauer (2016a), "Competition Makes IT Better: Evidence on When Firms Use IT More Effectively", World Bank Policy Research Working Paper no. 7638, Washington, DC: World Bank. Iacovone, L, M Pereira-López, and M Schiffbauer (2016b), "ICT Use, Competitive Pressures, and Firm Performance in Mexico", The World Bank Economic Review 30(Supplement 1)" S109-S118. OECD (2013), “Investment in ICT”, in OECD Factbook 2013: Economic, Environmental and Social Statistics, OECD Publishing.